This isn't a picture of my brother, it's a picture of me. But my brother looks almost exactly like me, only there's more of him. He's a whole sock. See, our Mom always has twins, but she's got this really wacky way of cranking us out. 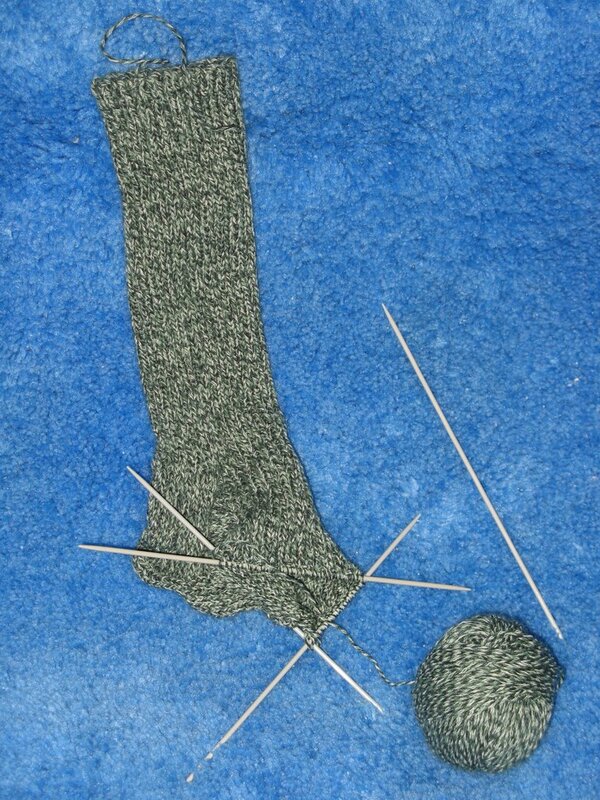 She almost never makes two socks from someone else's pattern. Instead, she makes one of us up out of her head, and keeps him in a little nylon zipper bag, and all she comes up with in the way of DNA are little notes on a yellow sticky pad (which also lives in the zipper bag). So when she goes to make a twin, she basically uses the original one of us as the pattern for the other, with a lot of counting and cussing, and just a few little incomprehensible DNA codes like: "c/o 72 st -- 22rows/2X2 rib -- 7" shaker rib -- divide heel -- 40 rows heel st. -- ctr .33 heel -- gusset dec. > 66 st. -- st. st. 5.5 inch -- beg. dcr. -- c/o 10 st. toe." This works OK most of the time, if gestation on the other twin starts right away. Problem is, sometimes Mom doesn't get busy on the other twin for awhile, but as long as she keeps us and the sticky note with the DNA code together, she can still make another one of us, and we'll look pretty much alike. But nooooooo, this time, Mom decided not to keep my completed brother in the nice little purple nylon zipper-womb we have been sharing. Instead, she put him away somewhere in our house (you should see our house) so he wouldn't get lost -- (please stop laughing) -- and then she started me from the abovementioned DNA coding, thinking that would actually work, when there's as many holes in that theory as a wheel of Swiss cheese -- and now she's not exactly sure how to finish me because she doesn't remember whether or not she continued the ribbing onto the foot-part of my brother, or changed to plain stockinette instead. So please, if you see my brother, please give him a ride home so we can have a happy reunion. His name is Timmy. He's a ribbed crew sock for a size 9 woman's foot and his cuff is about 7 inches tall. He's a nice green-and-white marl color, and he's a cotton-wool blend. He was last seen in a tote bag in the guest room. Mom started him last August and finished him just a few stitches at a time in the crazy weeks after Hurricane Katrina, then she put us both aside for a long time. 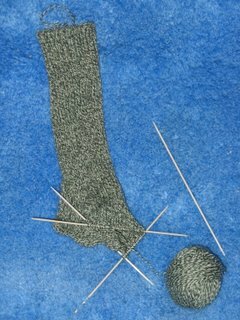 You can tell Timmy from other people's handknit socks because Mom hates Kitchener Stitch, so the toes are cast off in the three-needle style on the inside. Mom thinks nobody notices this and it is so embarrassing, you just don't know, it's like having to wear saddle oxfords to school. I really, really miss my brother and I need him so Mom can finish me, so if anybody can help, please call 1-800-THE-SOCK to report his whereabouts. And if nobody finds him soon, can somebody come take me away from this crazy lady and give me a good home? I don't eat much and I promise not to make any noise. That'll teach ya. Tommy Sock wanting to leave home even before his birth! Good grief!! Did Timmy maybe get left at Joanie's house? I've heard Annie-dog is partial to green. Hope you find him soon. Tommy, you poor lonely petsock. Or hang on - let's get existentialist here. Are you perhaps Timmy after all? Was Tommy your brother that you deliberately caused to be lost because you were jealous of him? Tell your Mom that I've put pictures of County Clare on my weblog especially for her, so she can feel the cool Irish breezes on her face. You're one cute little sock anyway! You can come over to my place and play with my two little girls when they're out of the crib and crawling around. I have been searching all over for Timmy. I have not found Timmy yet. On the other hand I =have= found a set of keys which I no longer recall the purpose of (more than two or three keys so it's a former workplace and not a former apartment)... a large number of dusty cat toys ... a cool pencil with a rattlesnake print on it ... a penknife long considered lost ... a ratty cat collar ... a letter opener shaped like a tarpon ... a bottle of Excedrin at least 25 years old (this was in a desk drawer, not the bathroom cabinet!)... a missing back massager ... and one divorced commercially made tennis sock.